The HJ-1 is a metal connector set that allows you to connect two 28mm pipes in a T-shape or to create a corner. This connector is the most easily assembled and the most commonly used in the entire Flexpipe system. You can rotate this connector up to 360 degrees before fixing it to make 45- or 90-degree supports for surfaces or just for supporting your products. The HJ-1 is so versatile that you can build whole custom structures with just this connector and some pipes. 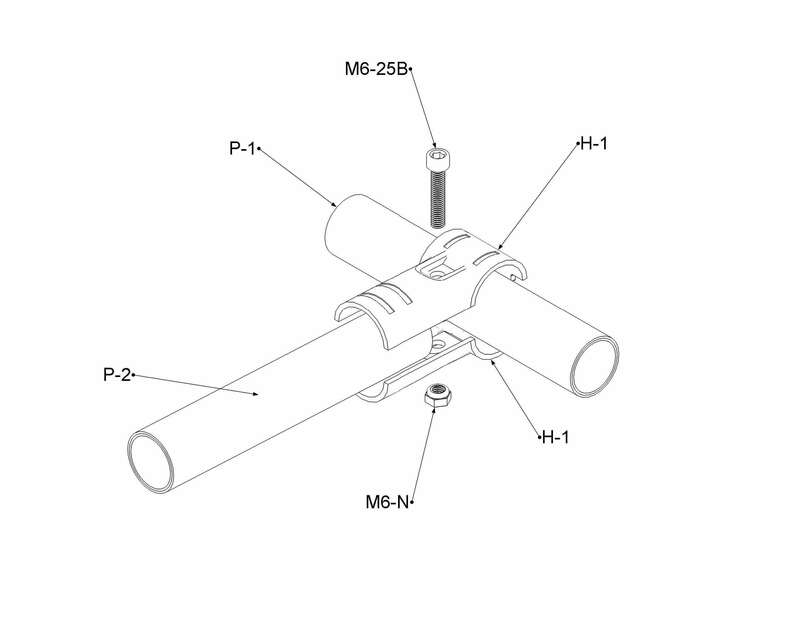 Applications for this connector are numerous, from corners to separations, pegs, 45-degree supports, and supports for accessories like the AW-HOLDER. To assemble an HJ-1 you need to group two H-1 together with a bolt M6-25B and a nut M6-N. You should always keep a box of these three parts in inventory, since they are going to be involved in 95% of Flexpipe structures. This connector was designed for quick and easy installation. The two H-1 making up the connector were designed with dovetails to ensure a super strong connection between the pipes. Lines on the exterior side of the fitting serve as a gage for pipe insertion limit. This is very useful for inexperienced users, such as floor operators who need to assemble their workstations. The HJ-1 was also manufactured with eight gripping striations and four screw holes for maximal strength when building heavy-duty structures. The HJ-1 is compatible with most 28mm pipe systems out there. This lets our new customers use the pipes they already have in stock so that nothing goes to waste. There is an antistatic nickel-plated version called HJ-1NP available for industries that handle electronic or electric components. Don't forget to select the ESD version if you need to build antistatic structures. 2- Take two connectors H-1 and group them around the P1 pipe. 3- Take a M6-25B bolt and a M6-N nut and insert them into the corresponding openings. Make sure to put the bolt on the more accessible side. 4- Tighten the M6-25B bolt and nut M6-N together a few threads , but no more. 5-Insert the P2 pipe within the HJ-1 between the first and second guides as shown in the plan. 6- Tighten completely the M6-25B bolt and M6-N nut together until the HJ- 1 attached firmly to the two pipes . A force of 9.8 Nm is recommended for this step.